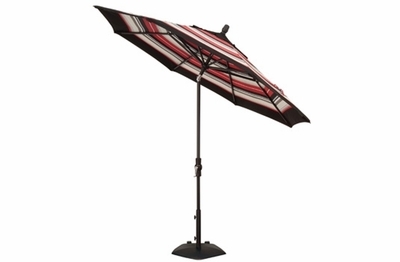 The hot sun is no match for this Treasure Garden 9' Collar Tilt outdoor umbrella. With its broad 9' canopy, coverage is substantial. This high quality patio umbrella is both sturdy and durable designed to withstand the harshest weather elements and with its wide selection of high quality Sunbrella and Obravia fabrics, your canopy will not fade, ensuring it retains its bold color from season to season. It has an easy collar tilt allowing you to angle the shade just where you need it. This outdoor umbrella is strong enough for both personal and commercial use. Add an upscale touch to your outdoor seating group with this gorgeous patio accessory.